Hesketh Prichard from the frontispiece of his 1910 book Hunting camps in wood and wilderness. Major Hesketh Vernon Hesketh-Prichard, DSO, MC, FRGS, FZS (17 November 1876 – 14 June 1922) was an explorer, adventurer, big-game hunter and marksman who made a significant contribution to sniping practice within the British Army during the First World War. Concerned not only with improving the quality of marksmanship, the measures he introduced to counter the threat of German snipers were credited by a contemporary with saving the lives of over 3,500 Allied soldiers. 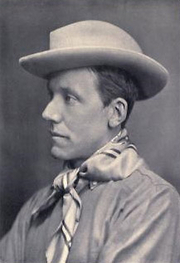 During his lifetime, he also explored territory never seen before by white man, played cricket at first-class level, including on overseas tours, wrote short stories and novels (one of which was turned into a Douglas Fairbanks film) and was a successful newspaper correspondent and travel writer. His many activities brought him into the highest social and professional circles. Despite a lifetime's passion for shooting, he was an active campaigner for animal welfare and succeeded in seeing legal measures introduced for their protection. H. Heron is currently considered a "single author." If one or more works are by a distinct, homonymous authors, go ahead and split the author. H. Heron is composed of 11 names. You can examine and separate out names.